Where do we collect our school’s ride passes? Beyond the Thrills organisers will issue your ride wristbands on the day. We will meet you at around 10.45-11 am at the tables near the Big Top Box Office (opposite the icecream shop, and not from the Box Office). Luna Park Sydney is located at Milsons Point, just under the northern end of the Sydney Harbour Bridge. TRAIN: Milson's Point Railway Station is 5-10 minutes walking distance. BUS: Coaches may drop off and pick up passengers at North Sydney Pool at the bottom of Alfred St South and Olympic Drive. Coach parking is available at Henry Lawson Ave, which is located at the end of Blues Point Road. FERRY: Ferry services run from Circular Quay and Darling Harbour to the Milsons Point Wharf . CAR: If any teachers need to come by car, Luna Park Sydney has its own car park with 389 spaces - fees apply - entry is via Paul Street, just off Alfred St South, Milsons Point. What clothing/shoes should students wear? Students should wear a school sports uniform for comfort and easy identification. If not in school uniform, students should have an identifying tag on their clothing. Note: Students MUST wear closed in shoes to go on certain rides. Refreshment outlets will be open for the purchase of food and drinks. Students may bring their own food and drink, but no glass or metal containers are allowed on the site. Luna Park Sydney's food packs - these can be ordered through us in advance and must be paid for in full on the day - please contact us for the cost of these and to order them. Will there be other people present at Luna Park Sydney? Luna Park Sydney will be open to the general public. Other schools or groups may be present on the day of your excursion. Luna Park Sydney is usually open regardless of the weather conditions. A number of rides at Luna Park Sydney are under cover or indoors. These include the rides in Coney Island, Dodgems, Rotor, Tango, Carousel and Ferris Wheel. If the weather is extremely inclement (storms and/or high winds), Luna Park Sydney management reserves the right to close the park early for safety reasons. Are there lockers at Luna Park Sydney? Luna Park Sydney has lockers available for your convenience. Cost is around $5.00 per 3 hours and $8.00 per 8 hours of use. Lockers can be found near the Carousel ride and under Coney Island. The restrooms at Luna Park Sydney have facilities that are accessible for wheelchairs. Download the PDF below for Luna Park Sydney’s ‘Rider Safety and Guest with Disability Guide’. What height restrictions apply for the rides at Luna Park Sydney? 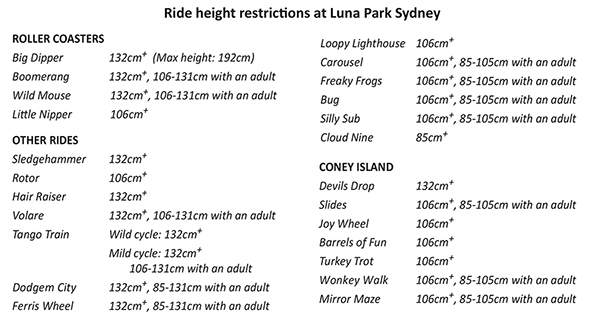 Luna Park Sydney has some height restrictions on rides for the safety of riders.